February 8, 2017, Keelung, Taiwan - Lian-Li Industrial Co. Ltd launches the PC-O11: the largest among the latest generation O-series chassis. 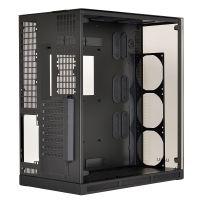 This case preserves the proportions of a tower rather than cube chassis while managing a dual-chambered layout and fitting conventional ATX PSUs. Unlike its little brother, the PC-O10, this new chassis accommodates several 360mm water cooling radiators in a gorgeous, spacious tempered-glass interior: the PC-O11 is the ultimate glass showcase for top-of-the-line enthusiast builds. The PC-O11 has up to three 360mm water cooling radiator mounts – users can choose to install three 120mm fans or a 360mm radiator on both the top and bottom panels in the main glass chamber. The PC-O11 also includes a removable bracket to prominently mount three 120mm fans or an additional 360mm radiator behind the front glass panel. Users can mount two thick 360mm radiators and a single 240mm radiator without needing to mod the case. The PC-O11 mounts E-ATX and smaller motherboards, with space for VGA cards as long as 430mm on its eight expansion slots. 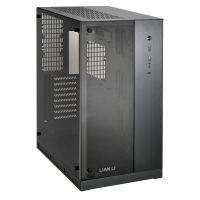 Its main glass chamber accommodates CPU coolers up to 150mm in height. The rear chamber hides ATX PSUs as long as 430mm and two removable drive cages fitting up to four 3.5” and two 2.5” drives or six total 2.5” drives. Users can also opt to mount 2.5” drives more prominently on the many fan mounts throughout the case – five 80mm mounts on the rear panel, two in the glass chamber and three in the PSU chamber, as well as any of the six 120mm mounts on the top and bottom panels. Similar to the PC-O10, users can purchase an optional accessory to mount two VGA cards vertically using riser cables. The kit replaces the included expansion slot covers and includes a single riser cable. The PC-O11 also includes a removable plate for mounting most water cooling pumps and reservoirs. The front panel includes two USB 3.0 and HD audio ports. The top and bottom panels include removable mesh dust filters covering the primary fan mounts. 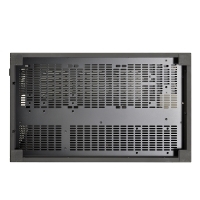 The drive cages and PSU mount include rubber vibration dampeners to minimize idle noise.